1.Pre heat oven to 350 degree and grease 8″ round tin to bake the cake. 2. Sift flour and baking powder 3 – 4 timeBlend butter and sugar to form a thicker paste. 3.Add flour in the beated butter and sugar and combine it slowly. 4.Add substance and use milk according to need to make cake batter and beat it properly with blender. 5.Crush almonds coarsely and make a base with almonds in the tin. 6.Then pour the batter in the tin and have aside to set for two or three minutes. 7. Now bake it untill the cake sponged. 8.You can also use a long pin to make sure that the cake is cooked inside. 9.Simply let it cool and remove tin. 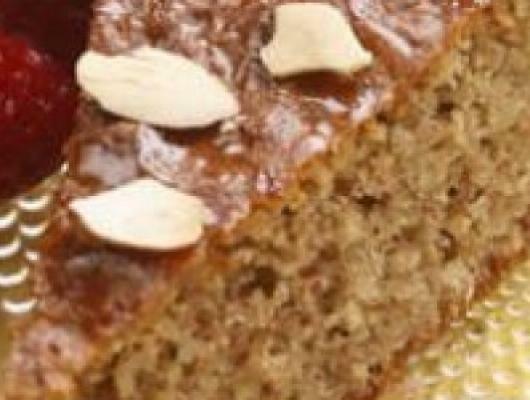 Honey in addition to almonds flavor this simple cake. It’s delightful for mid-day green tea or even a spring holiday dessert.